February 11, 2016 – Montreal, Quebec – Critical Elements Corporation (“Critical Elements” or the “Company”) (TSX-V: CRE) (US OTCQX: CRECF) (FSE: F12) is pleased to announce that Critical and Lepidico Ltd (“Lepidico”) has entered into a binding agreement (“Agreement”) that gives the right to Lepidico to acquire up to a 75% interest in the Lemare lithium project. $500,000 payment in shares or cash on or before May 10, 2016, such value to be determined by dividing the 5 day volume weighted average price ("VWAP") of the Shares immediately following the completion of the "going public transaction" between Lepidico and Platypus Minerals Ltd or another Australian Securities Exchange ("ASX") listed company. 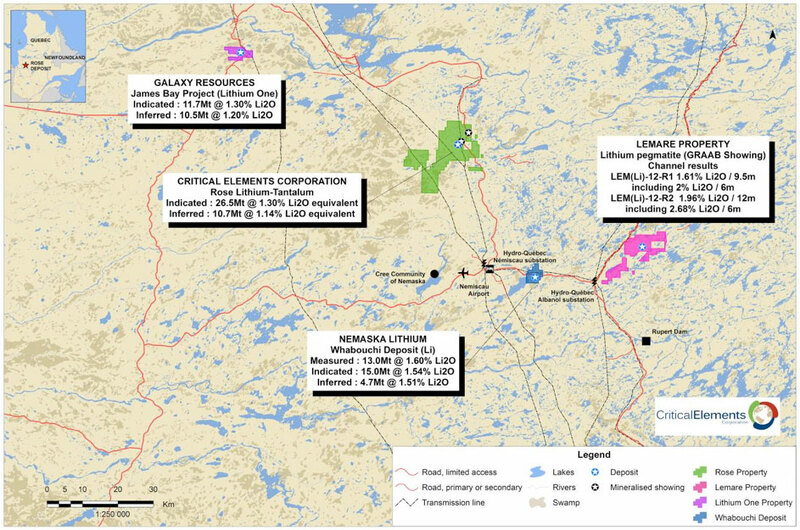 The Lemare project consists of 158 claims for a total ground position of 7,433 hectares (74 km2) in a region of Quebec that boasts other lithium deposits and known lithium mineralisation, as shown in the maps and table below. The Lemare project is potentially a new lithium field in an established lithium district. Figure 1. 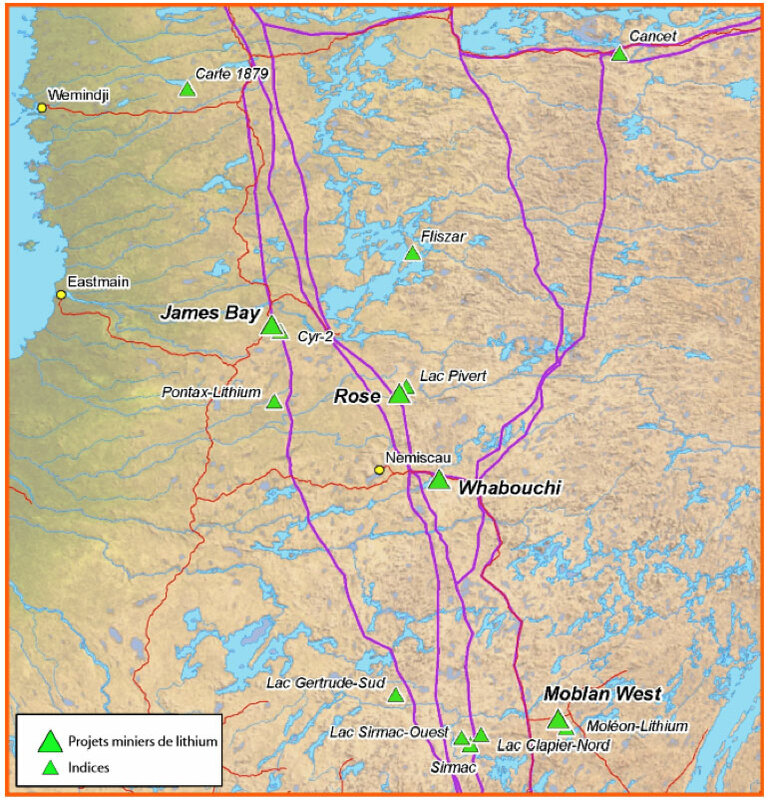 Location of known lithium deposits in the James Bay area of Quebec. Initial exploration at Lemare was undertaken in 2012 by Monarques Resource Inc. who discovered a “granite pegmatite dyke containing a considerable amount of spodumene.” The pegmatite ranges in apparent thickness from 4.8 to 14.2 metres and was followed for close to 200 metres in length on surface. The full length of the dyke remains unknown and is open in both directions. The pegmatite is undrilled so the depth extent also remains unknown. Figure 3. Location of the Lemare project claims in the James Bay area, Quebec, Canada. Outside of this trenching program, there has been limited lithium exploration undertaken at Lemare. Based on other lithium deposits around the world, it is a common occurrence for pegmatites to exist in “swarms.” As part of the due diligence process, Lepidico and Platypus will assess the potential for other pegmatites to exist within the project area. “Lemare is a significant landholding that is highly prospective and sits in a proven lithium district, and boasts a large pegmatite that is ready to be drilled,” stated Gary Johnson, Chairman, Lepidico. “The arrangement with Lepidico allows Lemare to advance towards resource delineation and project development over its other properties. Critical Elements is currently focussed on the development of its Rose lithium project. 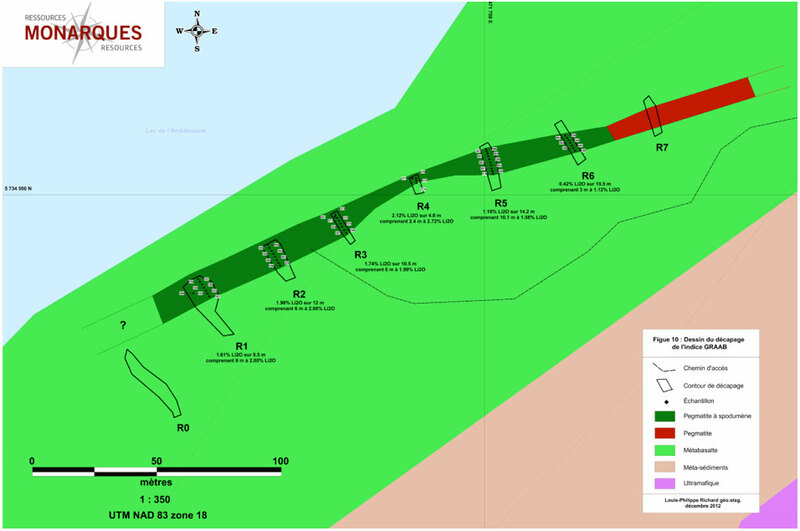 With Lepidico farming into the Lemare project, shareholders of both companies will be able to benefit from successful exploration of a highly prospective project,” stated Jean-Sébastien Lavallée, President and CEO, Critical Elements. On February 1, 2016. Lepidico and Platypus entered into an exclusive agreement to complete mutual due diligence for the purpose of investigating whether or not an agreement for the acquisition by Platypus of Lepidico or its assets can be agreed. Lepidico is a lithium exploration company and the 100% owner and licensor of the L-Max technology, a proprietary process which has the potential to commercially extract lithium and other by-products from unconventional sources at a competitive cost. Currently, the majority of the world’s lithium is produced from either brines or hard rock spodumene. L-Max delivers an opportunity to create a third supply source of lithium, namely lithium bearing micas such as lepidolite and zinnwaldite. Although there are a number of known deposits of lithium bearing micas around the world, these materials have typically been overlooked as a source of lithium as there has been no commercial process available to economically extract the contained lithium and produce lithium carbonate or lithium hydroxide that is suitable for end users. Lepidico was founded in February 2015 by Executive Chairman Gary Johnson and has achieved significant progress in a short period of time. Gary Johnson is a metallurgist and has over 35 years experience in the mining industry in various roles. Gary currently is the Owner and Principal of Strategic Metallurgy Pty Ltd, which specialises in providing metallurgical and strategic consulting to various mining companies, including Sirius Resources, which Strategic Metallurgy has been involved with since first drill core. Gary was also the former Managing Director of Norilsk Nickel Australia and was a key proponent in the development and commercialisation of Activox®, a process technology for treating refractory gold ores and nickel sulphide concentrates.